Hike till you can’t anymore! Kausani is situated a distance of 50 kms from Almora in Uttarakhand, and is one of very few locations where Mahatma Gandhi chose to rest for a few days. So much was the impact of this beautiful landscape on his mind that he gave it the title of ‘Switzerland of India’ for its incredible picturesque views and great trails. View from Kausani, you can see Trishul Peak in the left side. 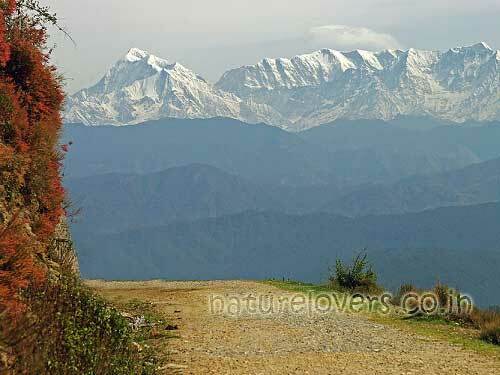 Kausani is specially bestowed by nature that makes it a breadth-taking destination from every angle. Lush green mountains, spellbinding snow covered views of the Himalayan peaks, sparkling creeks, quite valleys, gold-shaded sky at mornings and melodious chirping of birds – there’s not anything that will not make you come back to this hidden hill station. By road: A direct road from Delhi covers a distance of 420 kms to reach Kausani. A normal day’s drive takes about 8 hours to arrive at this sleepy town. The road passes through Muradabad, Nanital and Almora and makes up for the traveling time with stunning views of the scenery. By train: The nearest railway station is at Kadgodham, which in itself is a wonderful tiny town to explore. It takes about 5 hours by road to reach Kausani from here. By plane: Jolly Grant Airport in Dehradun is the nearest place you can take a flight to reach Kausani. The drive from Dehradun to Kausani takes about 6 hours and passes through Rishikesh. Kausani is best visited during October to February, especially after monsoons when it gets green and very pretty. The Baijnath Temple near the city center offers a rare glimpse of Indian heritage and ethnicity. It also has a river next to it, which makes a visit to this ancient site a remember-able event. A marvel in itself, the Lakshmi Ashram is where Mahatma Gandhi stayed while visiting Kausani. Open throughout the year, it has a very distinctive feel to it which cannot be matched by any other place in the vicinity. A beautiful and adventurous trek between the jungle that runs through river foot prints and the peaceful temple near the falls. A great way to feel refreshed and charged up. An an ideal sightseeing activity in Kausani, the Rudrahari Mahadev Temple can be reached only through a short trek from the jungle. A small waterfall with fresh cold water is really superb for those living in cities.